﻿Photographer Edward Beierle and artist Jutta Görlich work together as beierle.goerlich on their projects which, for the most part, are related to architecture, at locations that are found in transformation, that are used in a new way. 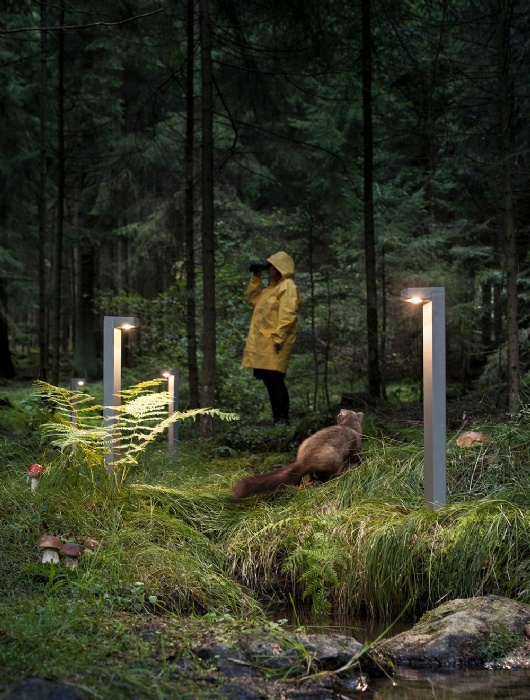 For ewo, the artist duo has produced a series of product photos for the new bollard light if. Even though if will be put to use within the context of architecture, beierle.goerlich decided to not depict any buildings. 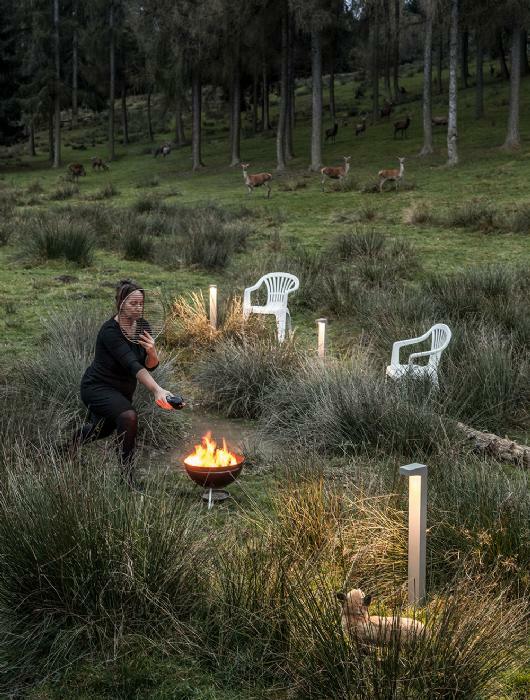 Instead, they moved typical garden activities – such as mowing the lawn, grilling, smelling flowers – from the familiar cultivated landscape into the forest. In the surrealistic images at dawn or dusk, protagonists stand next to each other without relation. The Black Woman – a recurring figure in the work of beierle.goerlich – and her actions are soberly observed by animals. 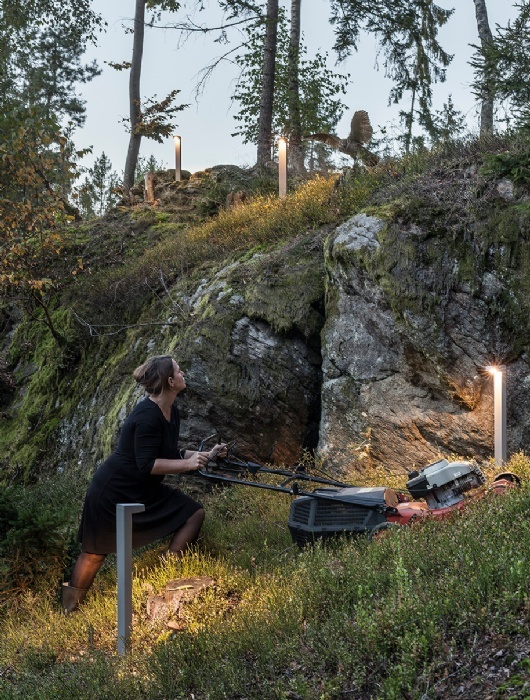 if is simultaneously both an understated witness and, with its light, it also intensifies the moment of the staging in the middle of the Bavarian Forest. if unites numerous possibilities in a reduced form. 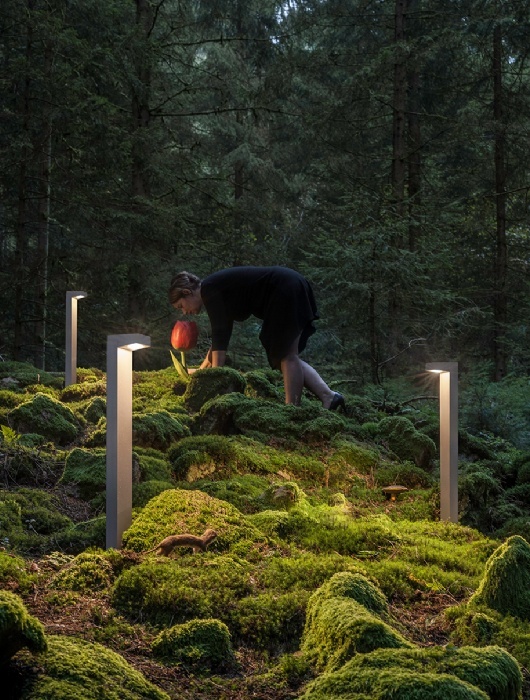 With if, ewo is expanding its portfolio by one more bollard light. The contours of the luminaire involve clear lines and consciously employed roundings. The series integrates the modular LED technology concept with which ewo has developed lighting solutions worldwide in the most varied of dimensions. Hannes Wohlgemuth, Head of Marketing at ewo, explains: “With if, we are introducing a bollard light that is also relevant in terms of lighting technology. It is important to us to make our modular system available to the designer for this product typology with which a wide variety of possibilities for the distribution and control of the light can be realized.” As with all systems from ewo, the LED technology of if can in fact be precisely adapted point for point to the details of a situation or an environment. This extreme flexibility comes in a restrained but mature design. Thus a unity of form is achieved throughout the entire lighting solution – however that may appear. The new if lighting family will be available starting in June 2017 with different heights and both bollard and wall versions. Find all technical details here.